Save the Children’s Den Day is here! On 17th and 18th June, children across the country are invited to take part in a sponsored den-building day, creating and building their own dens out of everyday materials to raise money to help improve children’s lives around the world. Schools and nurseries will be having fun with some imaginative den building on Friday, and on Saturday families can get involved at home or out and about with some good old-fashioned den-building antics! The Save the Children website has details of how you can participate: www.savethechildren.org.uk. 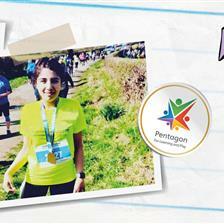 This is a brilliant initiative because it raises awareness of childhood poverty, and funds for vital aid such as food, water, clothing and shelter in some of the poorest countries around the world, or for those suffering from the effects of conflict in their home countries. But not only that, the idea of getting our own children up and building dens recognises the fact that den building is really good for them on so many levels. Opportunities to build different types of dens offers children the chance to use their imaginations for some creative thinking and learning; planning, investigating, negotiating, engineering, constructing, evaluating and connecting. Working with friends and adults they can build positive relationships, and be free to joyfully express their ideas and let their imaginations go wild! Can you remember when you last built a den? Happy childhood memories! Why are Dens SO good? We love to build dens, and have many memorable moments of building them and probably getting up to mischief too! Den building used to be a frequent fun-seeking activity and when we were children we would spend many hours outside, getting muddy and building these magical secret places. In recent years children don’t seem to get to do this so much but it would be such a shame for them to miss out on the fun and skills that den building brings. There are different arguments as to why this is, usually putting the blame on safety fears in one way or another, or gadgets, devices and computers ruling the roost. But this really doesn’t need to be the case and it’s time for a den revival! On Den Day (and any other day!) 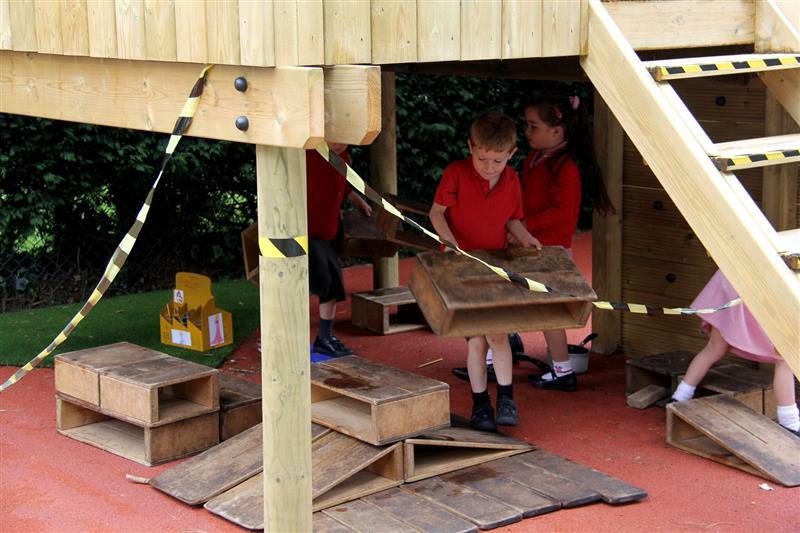 there are plenty of good reasons to go out into your school playground and get your Early Years and older learners experimenting with their constructions. Research in the UK, Scandinavia and America has highlighted that building a den and then playing in it can form a really important part of a child’s development, encouraging and reinforcing their sense of self. It is their chance to create a “home away from home” that is secret and special to them and allows them to express who they are. There is a real sense of adventure in building and hiding out in a den, experiencing independence away from adults. A secret den gives children privacy, it is a child’s own hideaway place to create in their style and to go to unaccompanied, with their own rules, but in a secure environment. These are all steps towards children being able to challenge themselves both physically and mentally in preparation for the independence and some of the challenges of adulthood. In fact dens can play a big part in learning how to become an adult. As children get used to the idea of den building and naturally want to go on to build more sophisticated dens, they will enlist the help of parents, grandparents or teachers for example to show them how to cut wood or how to fasten materials, or to help them acquire and transport materials. They will be actively engaging with these adults and will enjoy having them involved as they themselves learn the skills needed and learn how to become adults. Working together as a team to design and construct a den, children learn how to communicate their thoughts and ideas with each other. They will have to work together to agree on a design and to move materials that may be difficult to lift or place at different heights. They will need to learn the importance of good communication as a group, so that they can explain ideas and opinions to each other. They will have to negotiate with friends, brothers and sisters, and learn how to make compromises when not everyone can agree. They will have to decide team roles between themselves and they will learn new skills from each other. Some children will shine as leaders and some will shine as team players. Most of all, they will learn the importance of pulling together as a team towards a shared goal, and the wonderful feeling of satisfaction and group morale, an uplifting sense of belonging and achievement, when they have reached their aim. The pride and joy that flows from a successfully built den, after investing time and effort in it, will teach them that working hard towards their goals can be very rewarding. And once the den has been built? Well there is always something about being inside your own den, that you have built with friends, that makes everything more exciting. Children will be encouraged to reinforce friendships and to get together to read, play, and tell each other stories. A den can be whatever you want it to be! A child’s imagination can be set free as they play in their hidden castle, secret pirate’s cave, international space station or whatever else they have built their den to be! 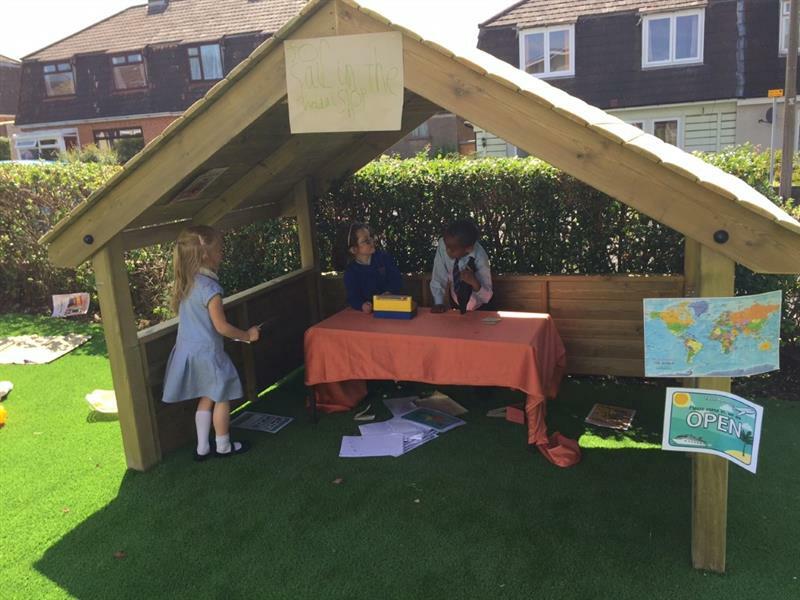 Whether building a den from scratch, or making the most of school playground equipment to build an extra special den, children will need to think creatively to build what they want to achieve and to make their structure sound. They can be creative with the materials that they use and they can be flexible with them. They will need to put their problem solving skills to the test to work out how to build their den successfully. Understanding how different materials can be used, and how the position of supporting props and weight of materials can affect the build and alter the shape of the den, all requires consideration. Where will the access point be? How can we make sure the den is strong and will stand secure? Does it look like we imagined it? Would or do we need to change anything? 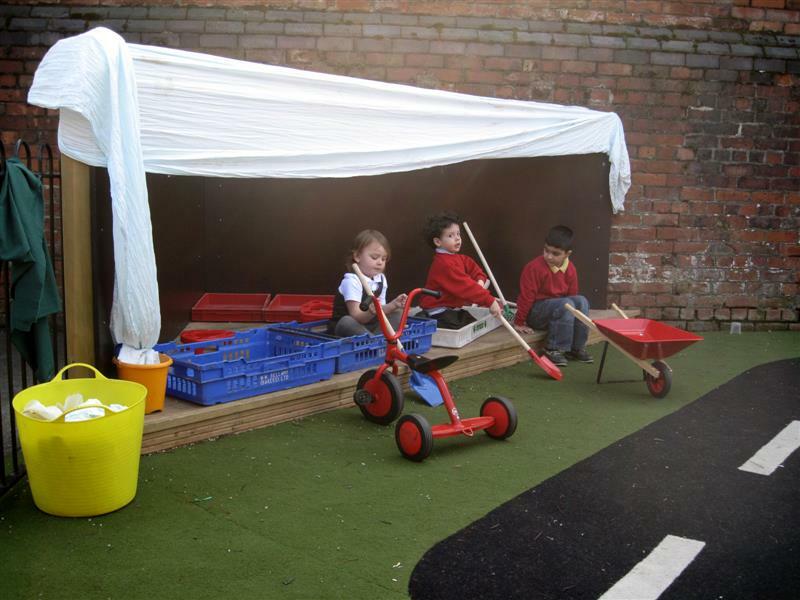 EYFS, Key Stage 1 and Key Stage 2 pupils can all benefit from practical application of maths, physics and engineering as they design and build their dens. 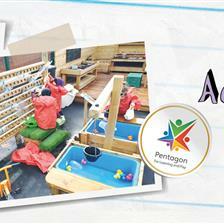 Problem solving is all part of the fun and adds to the sense of achievement when the den is ready for play! A den is a perfect place for Early Years learners to engage in role play, acting out and cementing their understanding of situations they have experienced in their own lives, or would like to experience! Whether their den is a shop and they are the shopkeeper, a medic in a hospital or a chef in a kitchen, they can learn how to approach scenarios from different viewpoints by taking on the role of a different character. This helps to develop their social skills and empathetic understanding, as by taking on a role of somebody else, they can experiment with different thoughts and feelings in a safe environment. They can try being whoever they want to be, develop their self confidence, become aware of others, and even test the boundaries knowing that they will not (hopefully!) be in trouble as it’s all part of the fun of being in their den! As with so many situations where children are engaged in outdoor activities and having fun in their school grounds, den building is a great physical activity for children without them even realising that they are getting good exercise! Whether running around collecting the materials, carrying heavy objects, pushing and rolling materials into place, or just engaging in active role play, their bodies will be moving all the time! As they build their den, children will be working on strengthening their muscles, developing motor skills and improving their general health and fitness. Of course den building inside is just as good for this, but the great thing about getting outdoors to build a den is taking advantage of the fresh air, exploring the natural environment and hunting for all the great den building materials that nature has to offer. Getting stuck in and a bit mucky, and coming inside with rosy cheeks at the end of the day, is an essential experience for all children! It doesn’t matter how big or small your school grounds are, there are many ways to bring the magic of den building to your children. With a little imagination the whole day can happily be spent building and playing in dens! Children should be encouraged to make the most of what is available to them, building dens using sticks, logs, blanket, string etc. Provide them with some basic materials, or ensure they have access to them within the school grounds, and allow them to follow their own ideas helping where they need it. Den building is a perfect opportunity for child led play so let them go for it. Encourage them to set their own challenges as to what they want to achieve. If they want their den to be waterproof they can have some fun with a bucket of water testing it out! 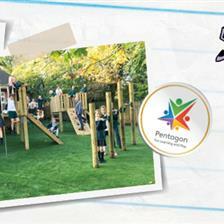 Even better if you can incorporate your existing school playground equipment into a den building session. 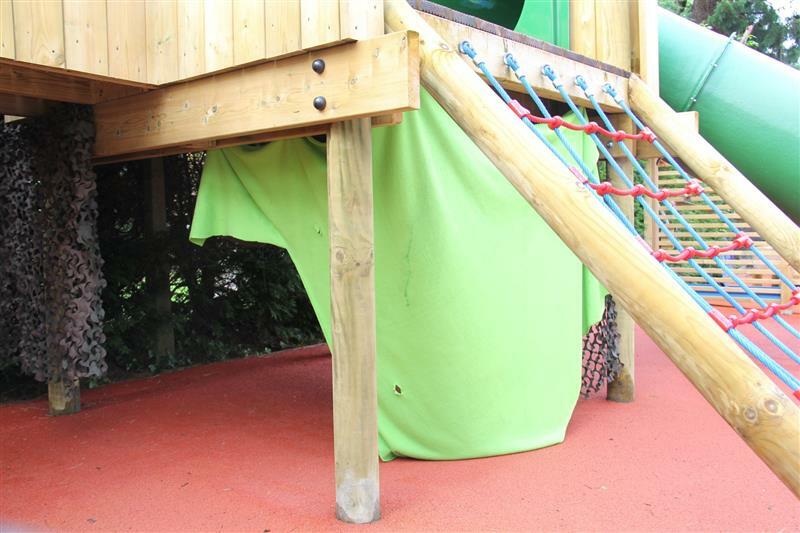 You can throw a blanket over almost any playground structure and let the children take it from there - they will know what to do! Pack them off with a picnic and let them create their own adventures. 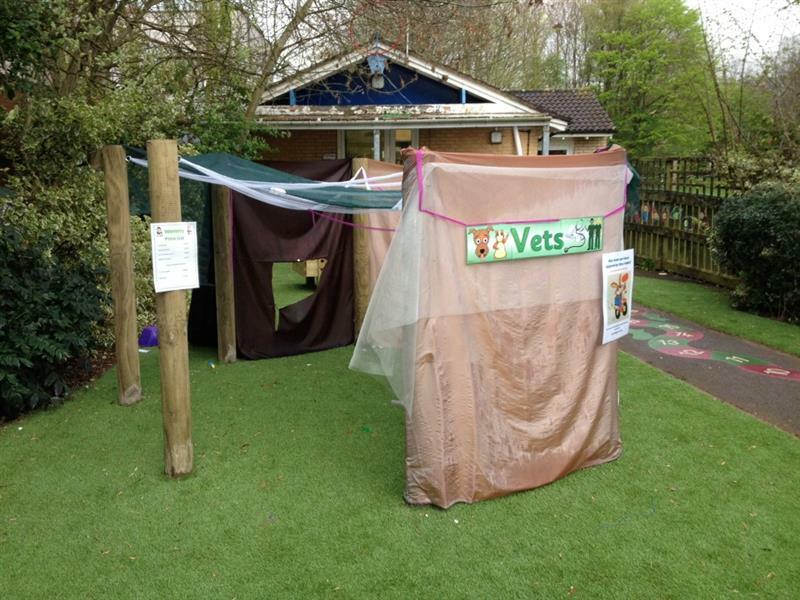 Den Posts are a simple but brilliant open ended resource for creating tunnels and dens. With rope or string threaded through the eyelets children can drape sheets, blankets, camouflage nets, ribbons (anything they like really!) over them to create their den of choice. An army base, a sailing boat, a bear’s cave, it can be whatever they choose! 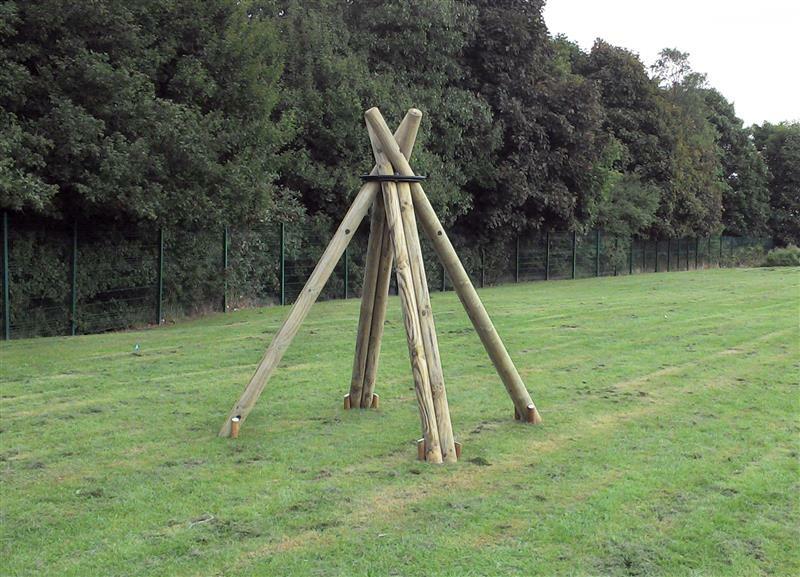 Wigwam Posts serve the same purpose and are perfect if you are a bit more limited for space. Playhouses and Gazebos can be transformed and themed with blankets, sheets, strategically placed furniture and cushions. It is a good idea to set up a “den within a den”. As the weather can be so changeable, this is a great way for younger children to get outdoors no matter what the weather, and have fun building dens in a safe outdoor environment without risk of it getting ruined too quickly by the rain. Bring out some chairs to your playhouse, put them against the wall and let children cover them with a sheet to make a bunk. Pad it out with cushions and let them fill it with toys for role play. They can hang “curtains” at the windows or cover the roof with leaves and twigs (a camouflage net or similar is great for this). No matter how “rustic” it may seem to an adult, children will love this and can be comfy and cosy in their environment ready for some storytelling, or run about having fun with role play. Spending quality time outdoors, getting a bit messy, being physical and burning off energy outdoors is what den building does best. 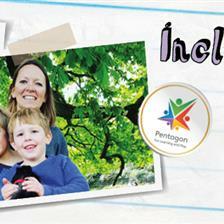 So this Den Day you don’t need any more excuses to let your children get busy! What will your playhouse be transformed into? We would love to see your den building pictures! 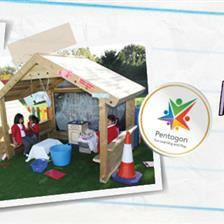 We have some fantastic Den-Making Playground Equipment and Playhouses to help your school get started too. We are excited to introduce The Burrow, a magical secret wooden den with a curved roof covered in artificial grass for extra mystery, and peep holes for keeping a look out! It’s a perfect fairytale den for little hobbits to hide away in! Please contact us for more information. If you are looking to enhance the Den Making possibilities in your playground or are interested in any of the products discussed above, please do not hesitate to Contact Us to see how we can help you.